This book describes the science showing that radiation from mobile phones and other electronics are a health problem, and how to protect yourself and your family. This is all done in a reader-friendly manner and without much hype. 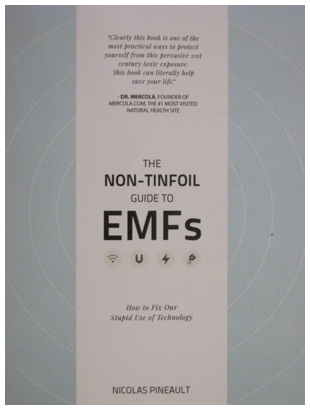 In an increasingly crowded field of books about health effects from the wireless revolution � and how to protect yourself � The Non-Tinfoil Guide to EMFs stands out. Written by an investigative journalist, it is free of jargon and full of common sense. Like some other books, it gives a good overview of the science that raises grave concerns about the long-term health effects from the EMFs we�re all exposed to. This overview is well written and understandable to anyone, without resorting to sensationalism. An appendix lists specific scientific papers for those who want to check more closely. Pineault makes the point that even though there are lots of studies that show no health effects, we should pay attention to those that do. If something is considered impossible, we just need one example to disprove it. He calls these his �black swans� (a bit confusing for people in Australia, where black swans are quite common). His point is a bit shaky, since it is not unusual for a scientific study to show an effect, even though there really isn�t one. These are called false-positives. However, since there are literally thousands of studies showing health effects from EMFs at very low levels, the weight of the evidence � the total number of these black swans � is what makes the case. Pineault also gives us a tour of the various types of EMF. Most books about EMF health effects include such a chapter, and since they are generally written by people without a technical background they tend to be rather inaccurate. In this case, Pineault must have consulted with some technical people, since there are just a couple of minor warts that are not important (cordless phones no longer operate at 900 MHz; the reason compact fluorescent lamps save energy is not because they turn on and off thousands of times a second). Some of the other books are also dogmatic or downright wrong. This book covers what is really a complex subject in a way that makes it easy. For each topic the reader is offered three levels of action. The first level is simple and usually costs nothing. The higher levels are slightly more involved and may cost a little. The reader can then choose how much is needed and how much to spend. This is an excellent approach that is well thought out. It would have been helpful if the book had an index, at least for the how-to part. The table of contents is not a help. On dozens of pages we are encouraged to seek the help of a �building Biologist or EMF expert.� He almost venerates the building biology people, who are at the forefront of making people�s homes healthier electrically. However, given this strong endorsement it would be reasonable if he told us more about how to hire one. It takes just a couple of months to obtain the basic building biology certification, and no other education is required � not even a high school diploma. With further training and practice the practitioner can then acquire more skills. The competence of the building biology people can vary greatly. Pineault deserves kudos for not blindly jumping on the Stetzer bandwagon. These are devices containing a capacitor, that are plugged into electrical outlets around the house. They alter the electrical waves on the household wiring, which can be helpful in some cases and harmful in others. The book correctly informs on that issue, though it doesn�t mention the limitations on the Stetzer meters. There is a brief mention of shielding canopies placed around the bed. The information is incomplete, but that is a rare example of sloppy writing in this book. I fully intend to dive deeper into the subject in the future, because there are thousands of testimonials and dozens of well-designed studies showing the efficacy of some of these products in reducing symptoms of electro-hypersensitivity (EHS), even when placebo-controlled. He does not provide any reference for such a grand statement and this reviewer has not been able to find even one single scientific study. We just found testimonials and a few reports where the participants were aware of the device. The placebo effect is well documented and can be quite powerful. There is a long history of people flocking to snake oil when they can find no other relief, and these devices sure look like snake oil. One clue is that none of these vendors can truly explain how their wares work, though many of them put up a lot of smoke that looks like an explanation. Another clue is that they do not make any difference in the readings of any instrument. To Pineault�s credit, he does recommend not to solely rely on these devices. The unit volts-per-meter (V/m) is used throughout the book, instead of the more commonly used uW/m2. This was apparently on the recommendation of a British EMF expert. Other experts prefer other units, such as dBm, but why not use what is used in most popular literature (and most of the biological studies as well)? This book is the best �how to start� book available. It is head and shoulders above the alternatives. For most people it is all that they will need. For people with severe EHS it is a good start, but more measures may be needed that go beyond this book. Other EHS book reviews are available at www.eiwellspring.org/booksandreviews.html. For how-to information on living with severe EHS, see www.eiwellspring.org.